This film was made as a contribution to an exchange program between Dutch and Suriname artist instigated by the Arts Council of Rotterdam. Due to my interest in Dutch colonial history, and my research into the culture of the Suriname Maroons in particular I was given the opportunity to work together with a group of artists based in Pikinslee, a village on the Upper Suriname River. A mysterious and enchanting trip to the pristine rainforest of Suriname. Images of the Suriname River, and a monumental Kankantrie tree. Men play the drums, while women sing and dance. The jungle. A man with a gun walking ahead. Around him a wealth of shapes, colors and leaves. An abandoned maroon camp, the different colors of the earth, fruits are scattered. Inside the dense forest. A man looks up with rolling eyes, he runs and jumps. He is sharpening his cleaver, and cuts open a coconut. Chickens and roosters eat their own brood. A woman drinking water from a creek in the woods. Eyes, lips, hands and hair. Smoke, a canopy with various objects. 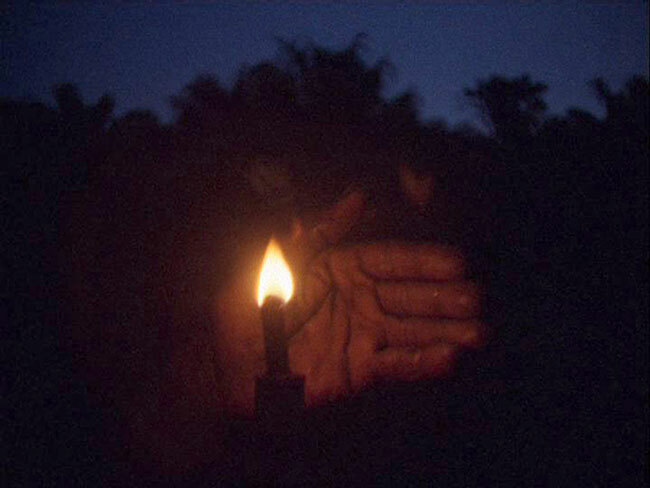 A man walks in the dusk with a small oil lamp. This project led to a second, more extensive collaborative project; Saamaka.